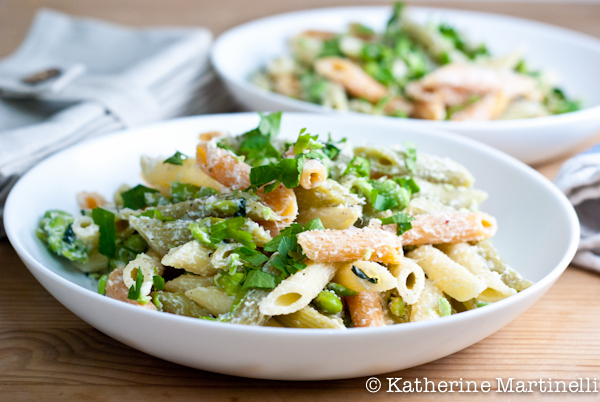 Here’s another simple, delicious, healthy weeknight pasta for you. Spring is in the air, and this dish is the perfect way to celebrate. Shelled soy beans are combined with plenty of chopped fresh basil and creamy ricotta to create a simple, flavorful sauce for pasta. I used try-color penne here, but any shape or flavor would be delicious. To save time, cook the soy beans briefly in the pasta water. This dish is on the table in about 20 minutes flat and is packed with nutrients – not to shabby! Don’t you just love easy pasta recipes like this? A quick and flavorful weeknight meal, this simple pasta dish screams spring. Put 1 cup of the soy beans with the ricotta and basil in a large bowl and lightly mash together with a fork. Add the pasta and remaining soy beans and toss to fully coat. Season with salt and pepper and serve with grated Parmesan. Head over to Barbara Bakes to win a copy through April 20! And be sure to check out That Skinny Chicken Can Bake to win one of two copies through April 24! Have you tried making ricotta? My dad’s done it a couple times, but I haven’t given it a shot yet. This sounds light, spring-like and delicious. I frequently use herbs and ricotta to make a light simple pasta sauce. Definitely spring time pasta and the edamames are a wonderful addition. I could eat a ton of them with a little sea salt. Happy Wednesday! This looks so bright and fresh! I love simple pasta dishes like this, especially this time of year. Keep ’em coming! This pasta looks so beautiful and delicious! This sounds lovely! I love how quick it is too! I swear this one might be just for me! I so need quick and simple right now! I’m so happy you post another pasta dish! I eat rice all the time and pasta is now rare on my table. Your pasta looks gorgeous and seeing edamame has put a big smile on my face because I love it as a snack and also experimenting with it in different, also European dishes. This is SOOOO my kind of recipe. I can’t wait to try it! I love pasta with ricotta! It just makes it so creamy and delicious! I have to try this version! You are absolutely right! This is a perfect spring dish!! I’ll bet some fresh chopped tomato or even sundried tomatoes in there would be great! Good idea with edamame. Lots of good fiber and protein! Thanks. Another fabulous pasta Katherine! Easy and tasty. Love the use of ricotta just smashed up with the basil for the “sauce”. Great recipe! Fresh and creamy at the same time, love this! I love how everything you make always looks fresh and vibrant in color. This dish sounds amazing! Katherine, I love nothing more than simple and fresh dishes like this! oh my gosh this just sounds wonderful!! I never would have thought to use ricotta as a sauce. Light and healthy pasta dish! It’s going to be 90F in SF this weekend, yeah really crazy for April weather. This pasta looks perfect for this weekend! I can never have too many pasta dishes! And I love cooking veggies with the pasta – I do this all the time! Mainly because I’m lazy, but it’s so easy. And who wants to wash an extra pot? (Remember, I’m lazy!) Good stuff – thanks. Another light dish that looks amazing! You make me want to eat healthier!! What a terrific pasta dish, Katherine! I love its simplicity. I wanted to like this so much, I really did. So clean, so simple. But it was so incredibly dry. I added pasta water then cream. No go. And this was with the full order of the sauce and half the amount of the pasta. I do not know what happened but I was so disappointed! Kate, I’m so sorry you didn’t like it! I was surprised when mine didn’t turn out dry because I know it has the potential to be, but it really didn’t. I’ll have to test the recipe again and see what went wrong. The type of ricotta and how much moisture is in it can have something to do with it. Anyway, thanks so much for the feedback!